That’s not to say you won’t find me out in the garden this time of year! This fall, I’ll still be making new beds to plant in spring, moving plants around, and finishing up work on the water garden I installed over the weekend—but more on that insanity in a future post. At least I won’t have to worry about what the weeds are doing out there. I’m especially excited about this blog, because I love writing about gardening nearly as much as I enjoy digging in the dirt. I’ve long needed a journal for my own garden, Hackberry Point. I’m planning to post about everything from what’s in bloom and combinations that have worked here, to techniques and activities I am experimenting with. I’ll also continue to write about outstanding native plants, a feature that was very popular in my Eastern Shore Gardener newsletter, which has morphed into this blog. Plus, I’m also sure I won’t get away without pictures and posts of my family of rescued dogs, or the cats and parrots that oversee my office. So, you’ll find a bit of everything here. I hope you’ll join me! You can subscribe by clicking the link on the right side of the screen, and the posts will appear in your e-mail in box. 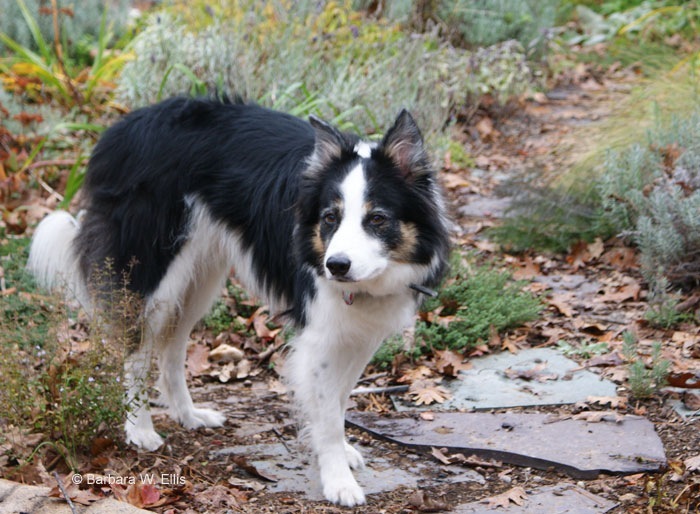 ABOVE: Garden helper Bienn, a rescued Border Collie. Bienn means “big mountain” in Gaelic. Congratulations on the new blog, Barbara. It looks great! 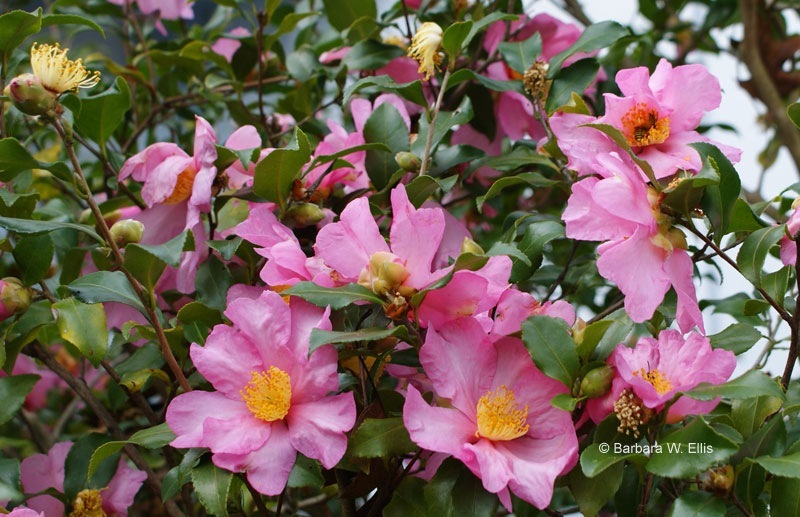 You are so lucky to have those beautiful camellias still in bloom – just one advantage to moving to a warmer zone, huh? Hi! Thanks for visiting! Yes, camellias in November are one advantage of living down here in Zone 7! I love having flowers so late. 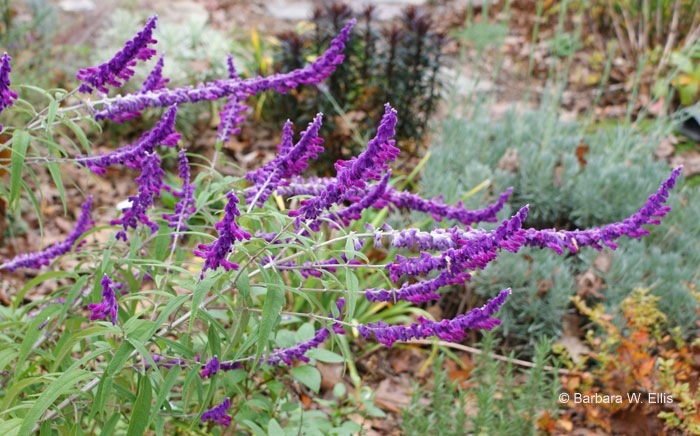 I also have some lavenders that have put out late spikes, plus Gaura lindheimeri ‘Siskiyou Pink’ is still in bloom. That is one handsome dog you have there! Wonder where he came from? Glad you started blogging, I will enjoy seeing ESG come to me inbox. Ah, yes, the Bienn dog is quite the handsome boy, a wonderful companion, and a pretty good garden helper as well! As you well know, he’s not my first rescue Border Collie, but he is my first one from Mid-Atlantic Border Collie Rescue! Stay tuned to see more of my menagerie! Glad to hear you’ve signed up to get ESG in your in-box! Thank you for your vast knowledge. I am getting ready to renovate my backyard. Thanks for visiting Rebecca! Good luck with your renovation.